Firstly sorry folks for not being able to update this site as much as I would have liked last year as was very busy with family stuff and martial arts. I did go a few times at the end of last year and had a few nice carp from a local lake also my son Leon had a few nice carp up to 14LB 8oz. I will post pics very soon of these few visits. Well the new season was upon us. 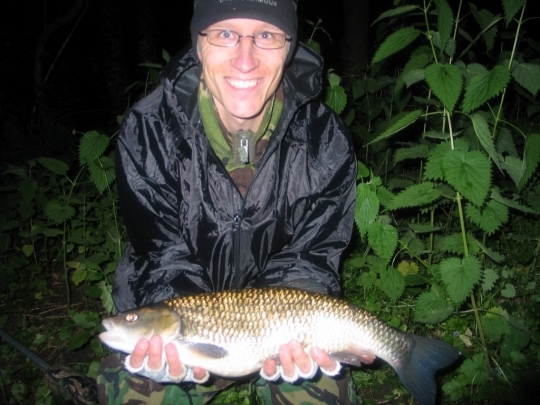 Through the close season I had visited the river Wensum a few times and had noticed that normally you would see a few barbel here and there but throughout the close season we did not see a single barbel. I know that there had been a few otters down there and a few of the surrounding lakes had been hit hard by the otters with many of the lake owners putting up new otter fences to keep them away. 16-6-13. On the Saturday night 15-6-13 I met Bertie aka Mathew Vincent around 9pm and we walked to our swims where on the way we proceeded to get eaten alive by mosquitos. Very annoying. We baited up a few swims and waited till midnight for the fun to begin. Bertie had the first fish of the night which was a nice chub of 3LB 4oz. Bertie then had a further 5 chub with practically one every hour throughout the night on the pellet with the biggest being 4LB 8oz. All nice fish. I had a few knocks but nothing. Eventually that changed with a stonking bite on pellet resulting with a lovely 5LB 4oz chub. I then changed tactics to maggot and had a lovely Dace and small perch. 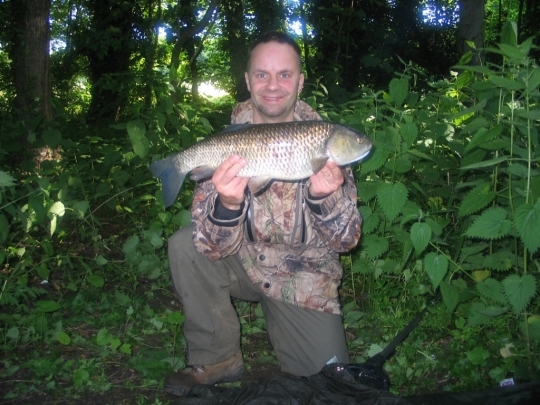 Below is Bertie looking well happy with his 4LB 8oz chub his biggest to date, well done son. All in all a good trip, Bertie get a new Chub pb and me having a decent first fish of my 2013 season. We are already plannnig our next trip and looking forward to it. Make it happen.